Taking a trip to see my aunt today and my little wanted to bring her flowers. 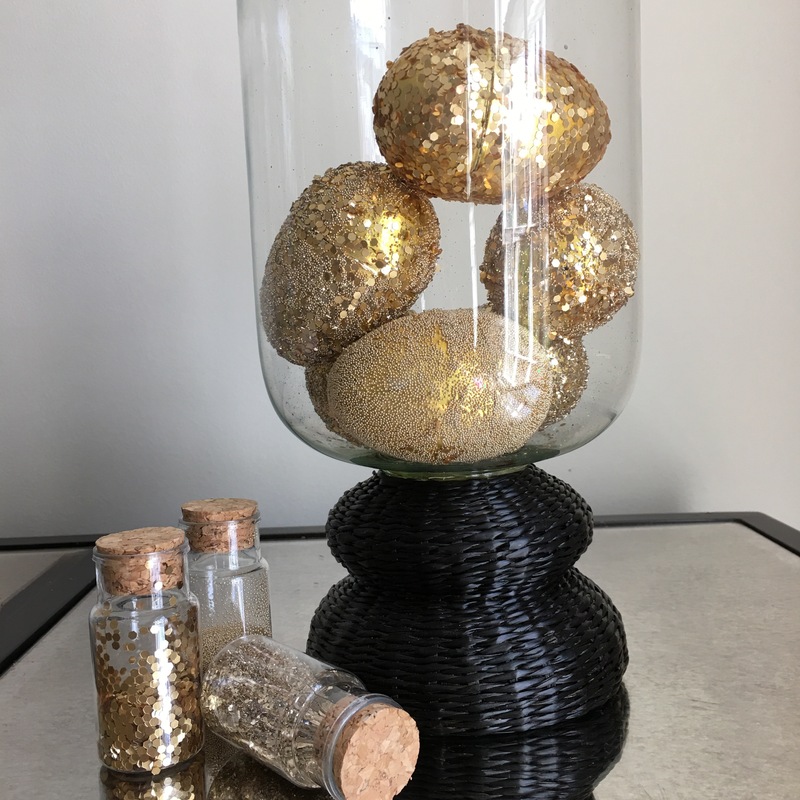 Traveling two hours in the car I knew fresh flowers would be a challenge, so I thought making something that will last would be even better. This was so so easy, and allowed my daughter to totally feel like she was really part of the project, which is key in her staying engaged. 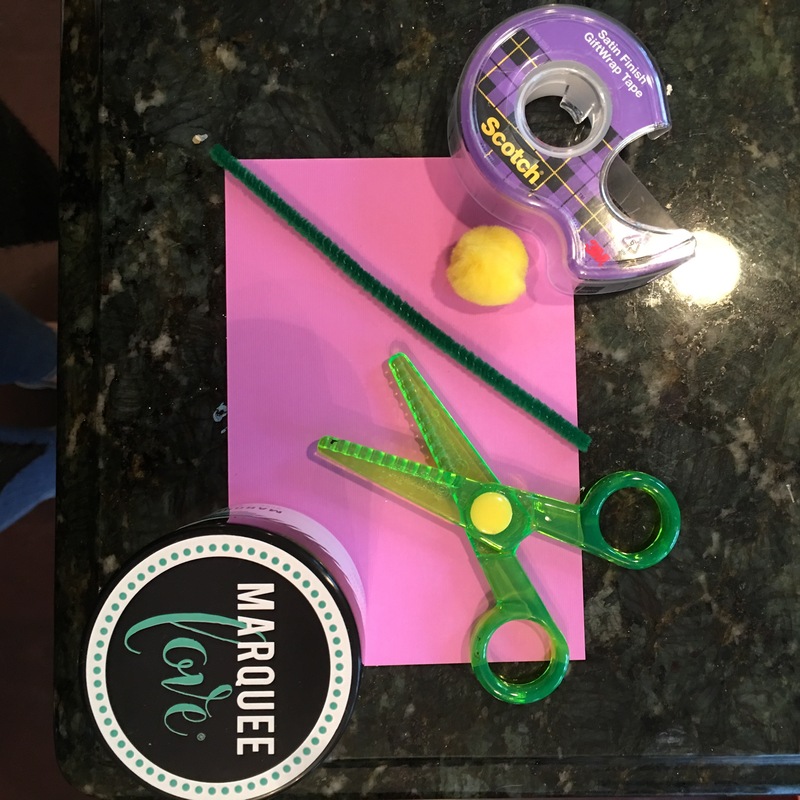 Green Pipe Cleaners, Colorful paper, Yellow Craft Pom Poms, Kids Scissors, Tape, and Craft Glue. Bonus, would be a colorful metal bucket, for display. 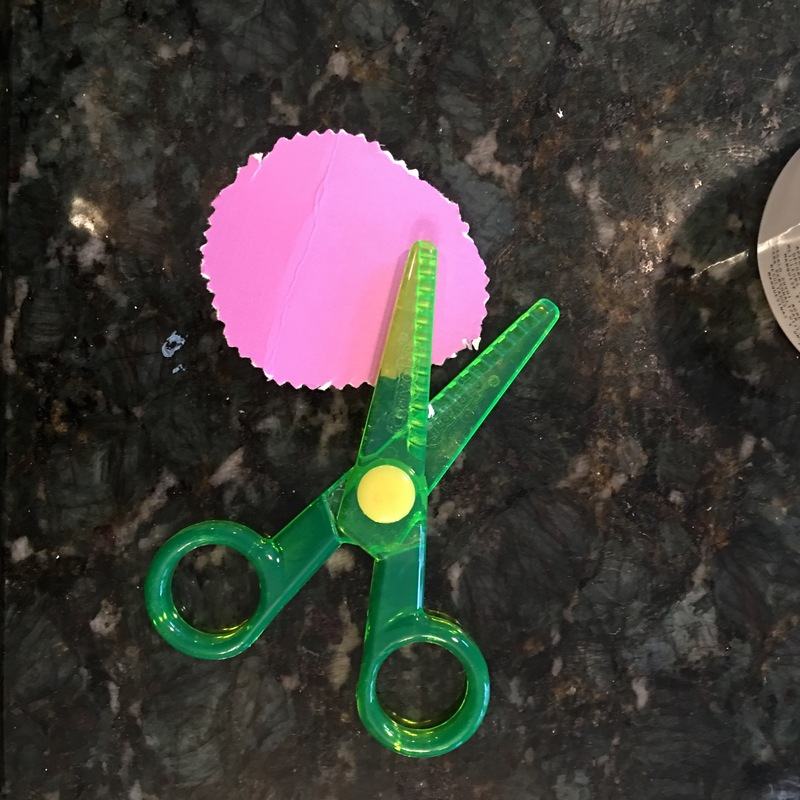 Step 1 : Had my daughter cut a “roundish” shape from the colorful paper. 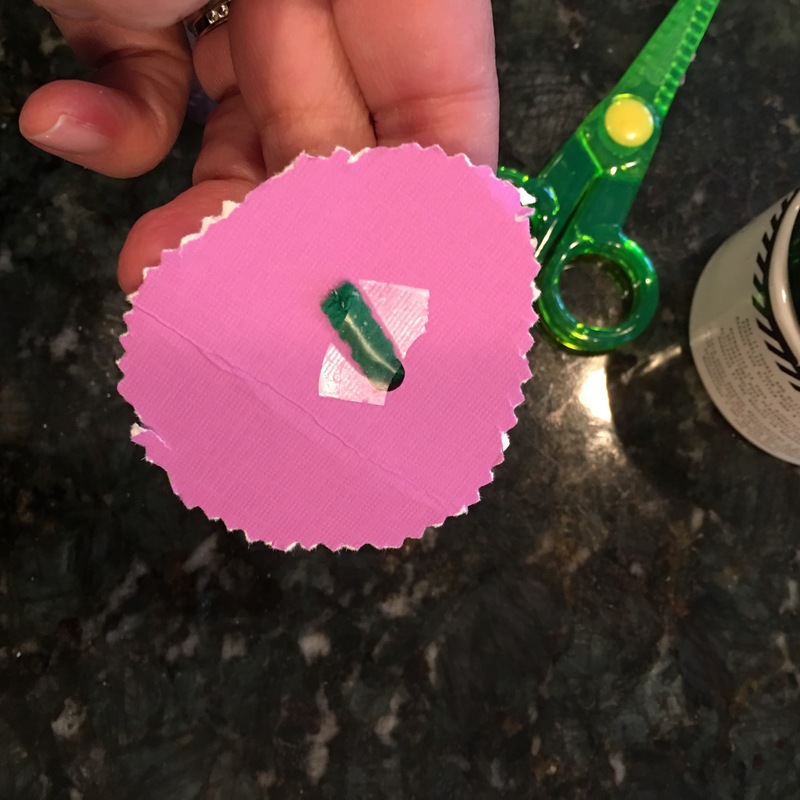 Step 2: I cut the pipe clear in half, and then used a hole punch to connect the pipe cleaner to the flower and secured it with tape. 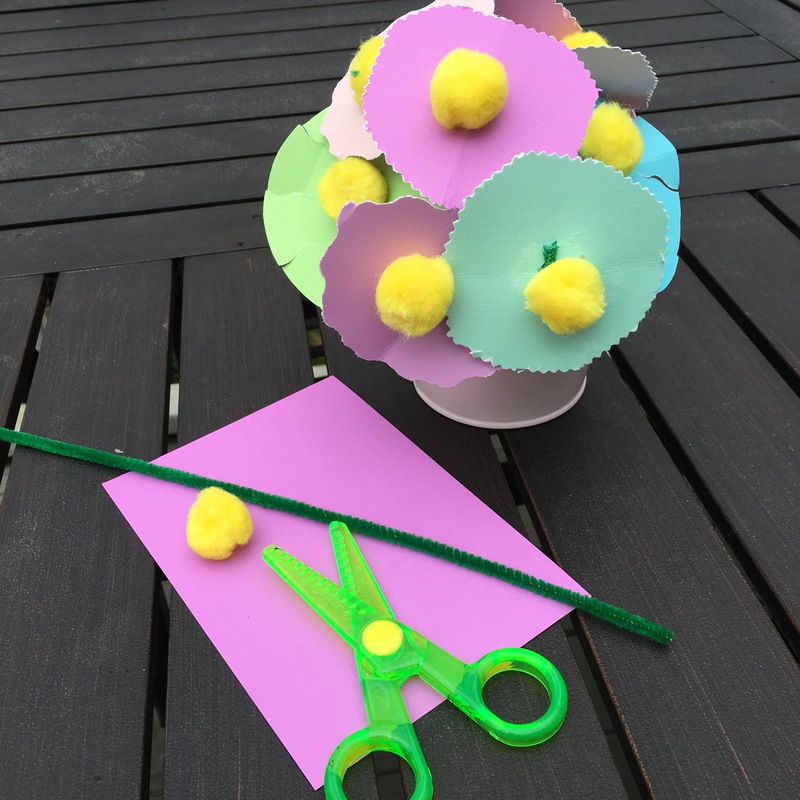 Step 3: Dip the yellow Pom Pom in glue, and attach to the center of the flower. 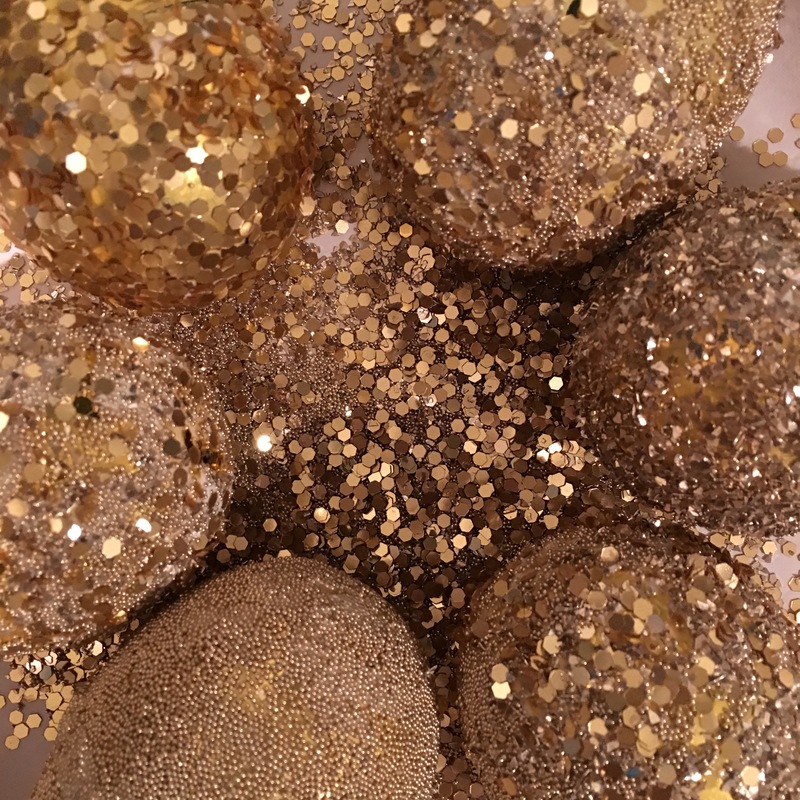 We placed them in a cute little metal bucket, however they would look adorable wrapped in tissue and tied with a ribbon too! Great little something to give to special people for Mother’s Day or Teacher Appreciation Day coming up in early May. This is basically a box cake mix…with a little twist to it. 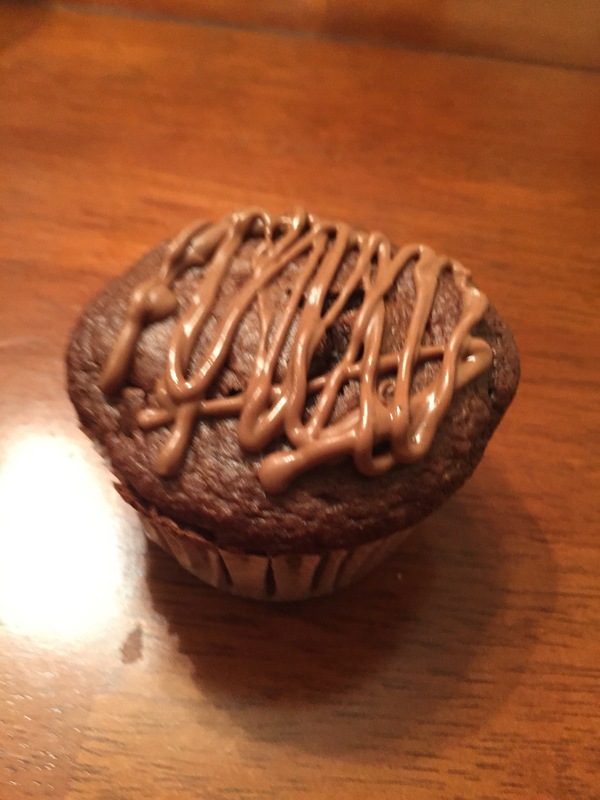 I saw something similar in a bundt cake and decided to alter it a bit and make cupcakes. 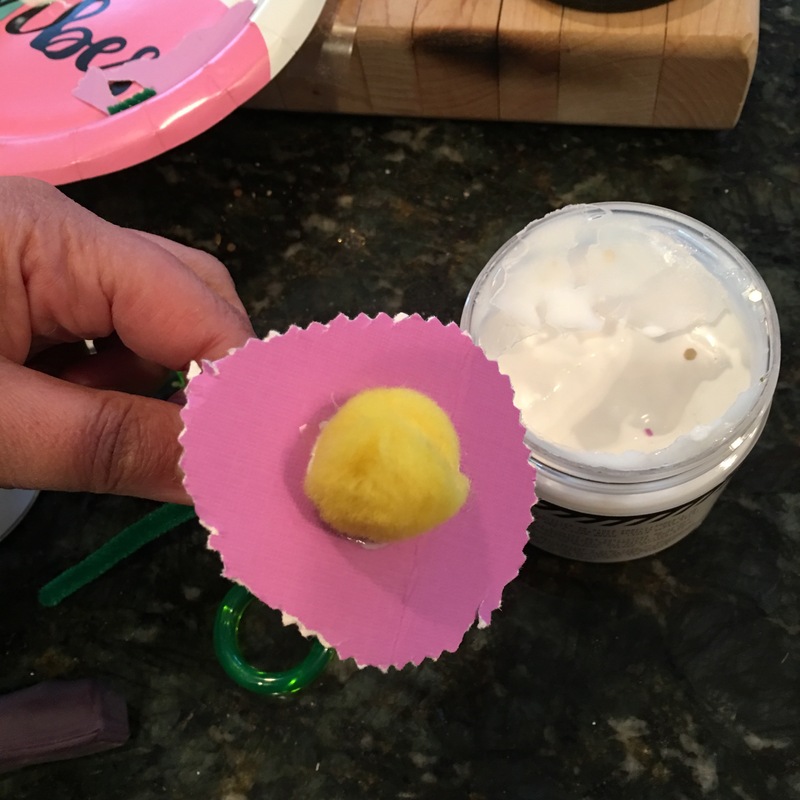 I find cupcakes so much easier to deal with; easy to give away, easy to serve, easy to sneak behind your children’s back. Devils Food Cake Mix: make the recipe according to the box, however replace the water with a cup of black coffee that is room temp. After you add the eggs and oil,add a cup of Sour Cream. Filling: 1 cup of peanut butter, 1/2 cup of powdered sugar, and half a stick of cream cheese. Mix those ingredients with a mixer and set aside. 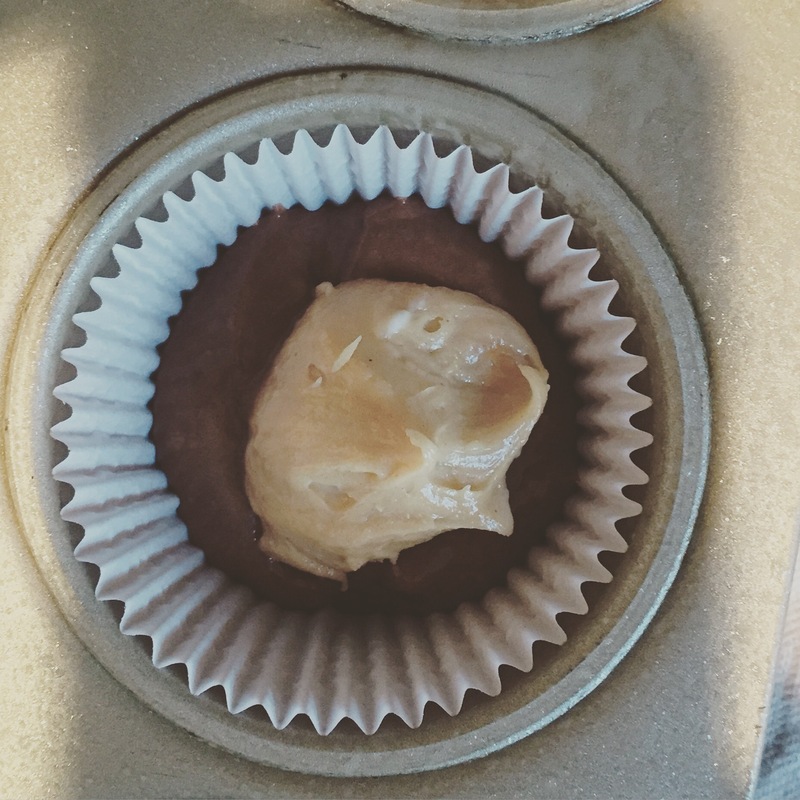 Fill cupcake cups about 1/3 of the way and then add the peanut butter filling. Then add additional cupcake batter to the top. Bake at 350 degrees for about 20 minutes (test with a tooth pick). Let them cool and then pop them out. 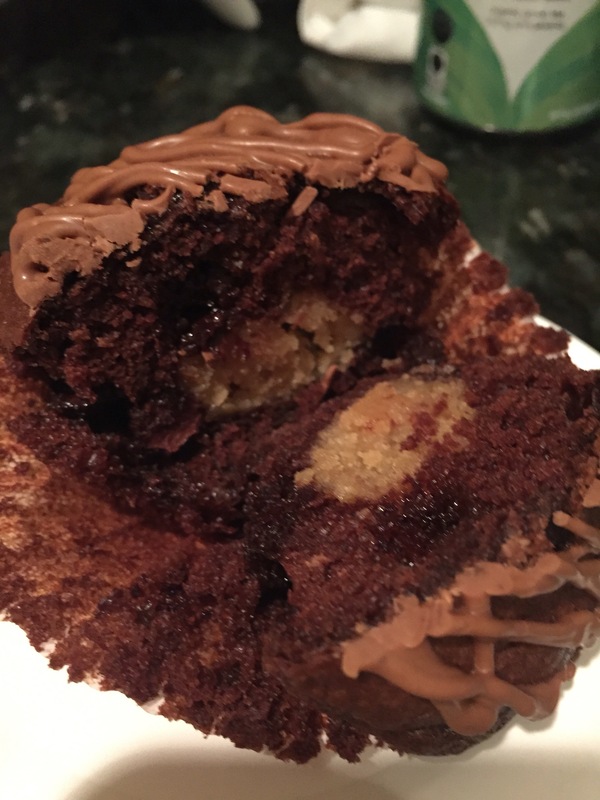 I enhanced them by melting peanut butter and chocolate chips and using a squirt bottle to drizzle on top. 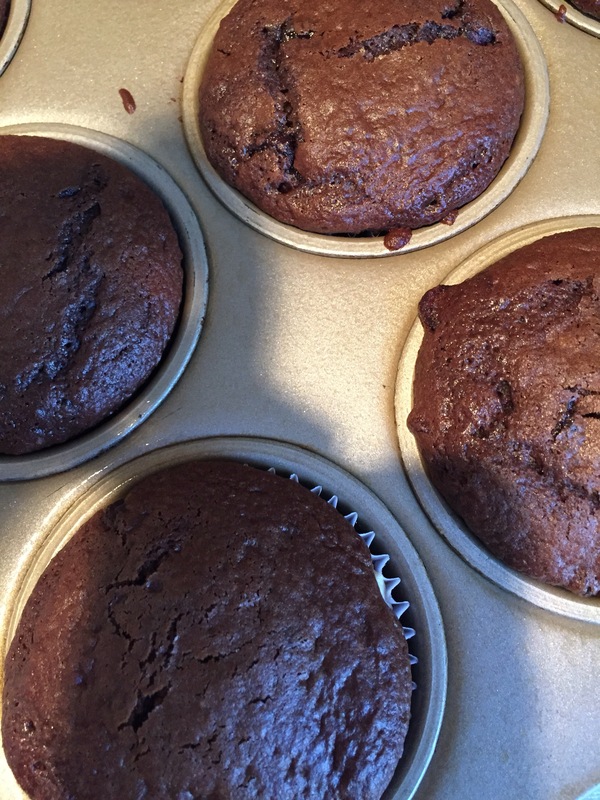 The cake is super moist and the filling is very smooth. The cake is not overly sweet so it won’t over power the peanut butter filling. The coffee is not noticeable, however everyone that tried them knew there was something unique about the taste, but could not place it. 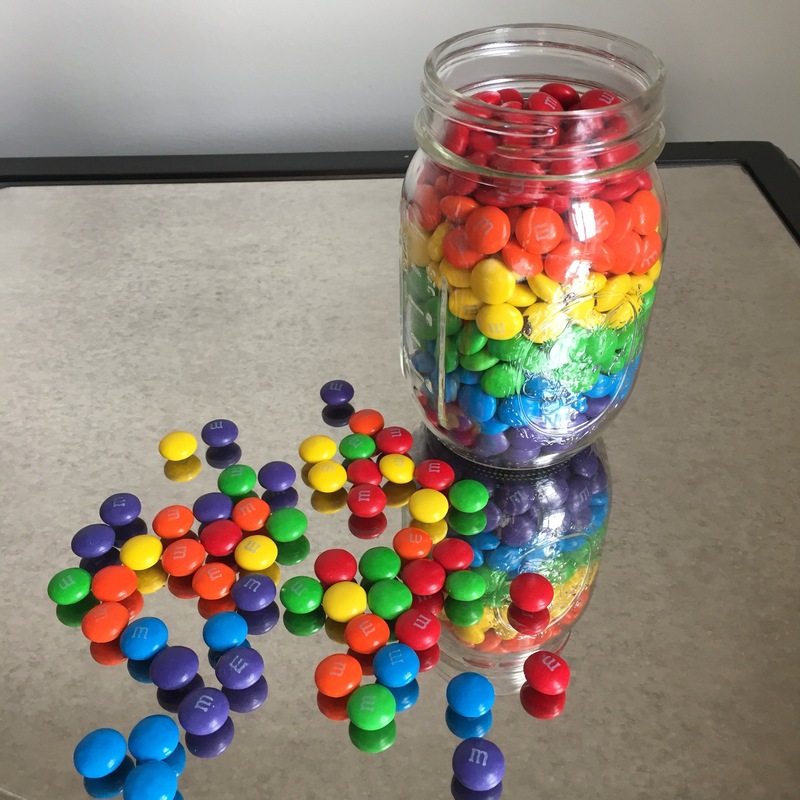 Very easy to make! A total fan favorite! Would have been easier if I took out my hand mixer for the filling, so I did not need to clean the mixer bowl to make the cake. However if that is my only struggle I can deal! I froze a few so I could take them out next time a had a crowd. It is no secret that I love Saint Patrick’s Day. 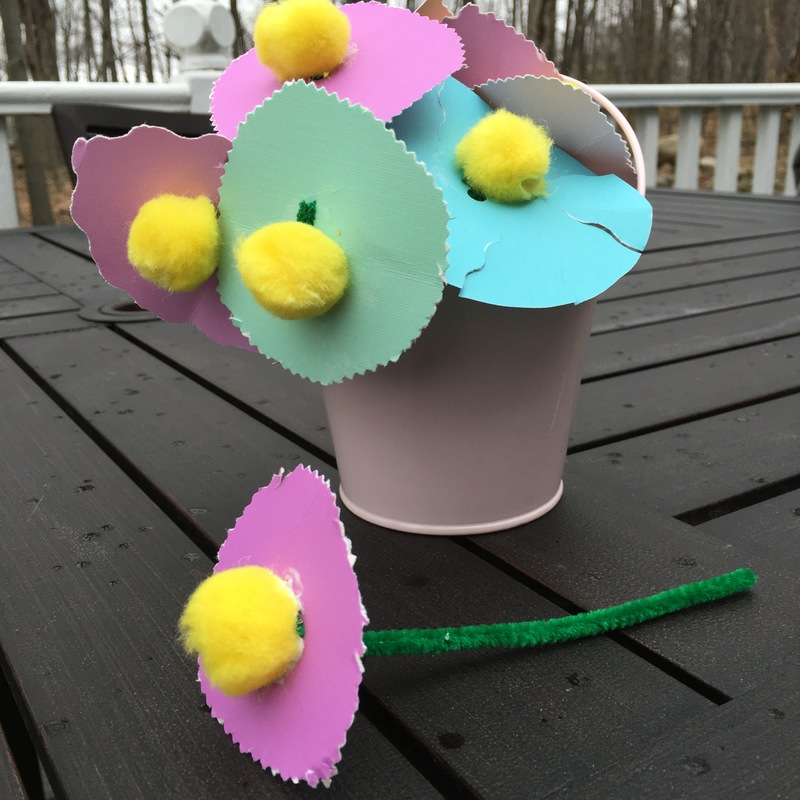 I find it fun to make it something fun for the kids to look forward to. I always find that SPD is the first sign of Spring , even when it snows! So for a full week before SPD, a cute little Leprachaun sneaks into our home and hides a rainbow! No shenanigans here….no time for green foot prints on my toilet at 6:30 am. Our fella hides one thing! 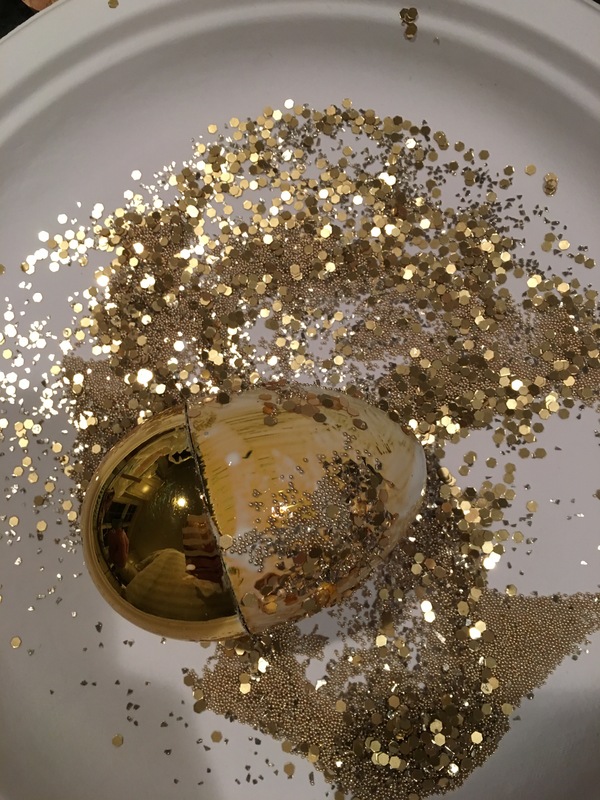 When they find it there is a gold coin waiting for each child. They know they can only hunt together, so it encourages teamwork. On SPD, they find the rainbow and then there is a an actual “pot of gold”waiting for them, with some cute goodies. 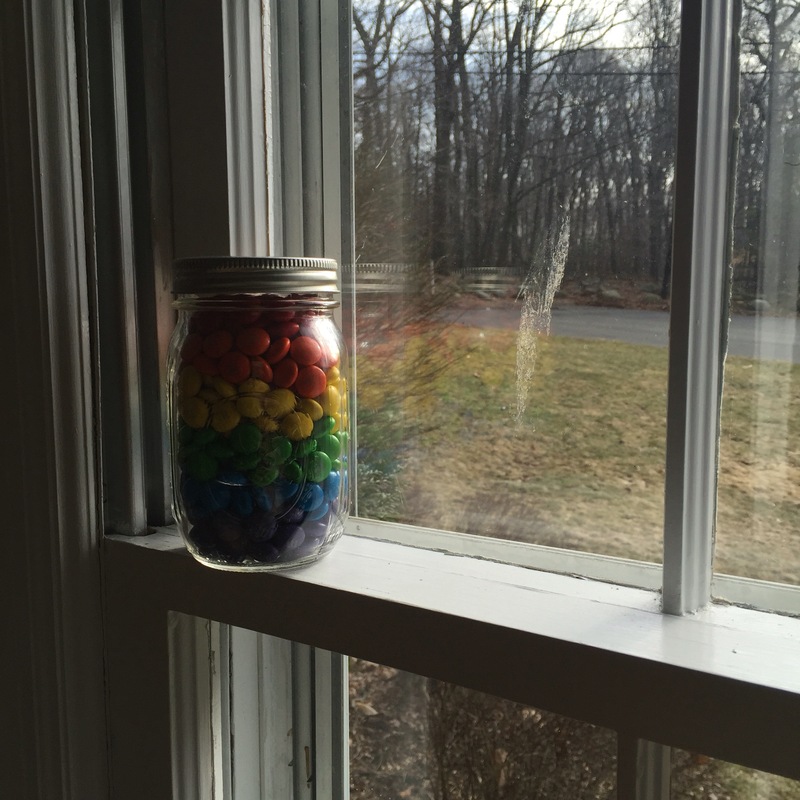 This year I am using a mason jar with a rainbow of M&M’s. It looks cute around the house and it will be fun for them to break into on SPD. Had a meeting last night. Everyone was bringing food that I knew would not get touched, so I went with a quick floral arrangement. While I am not a huge Real Housewives fan, I never forgot what The Countess said about if you bring flowers bring them in a vase. Point being the hostess won’t have stop what she is doing to tend to the flowers. My friend the hostess loves her Irish heritage (who are we kidding so do I). So I went with a fun green theme. 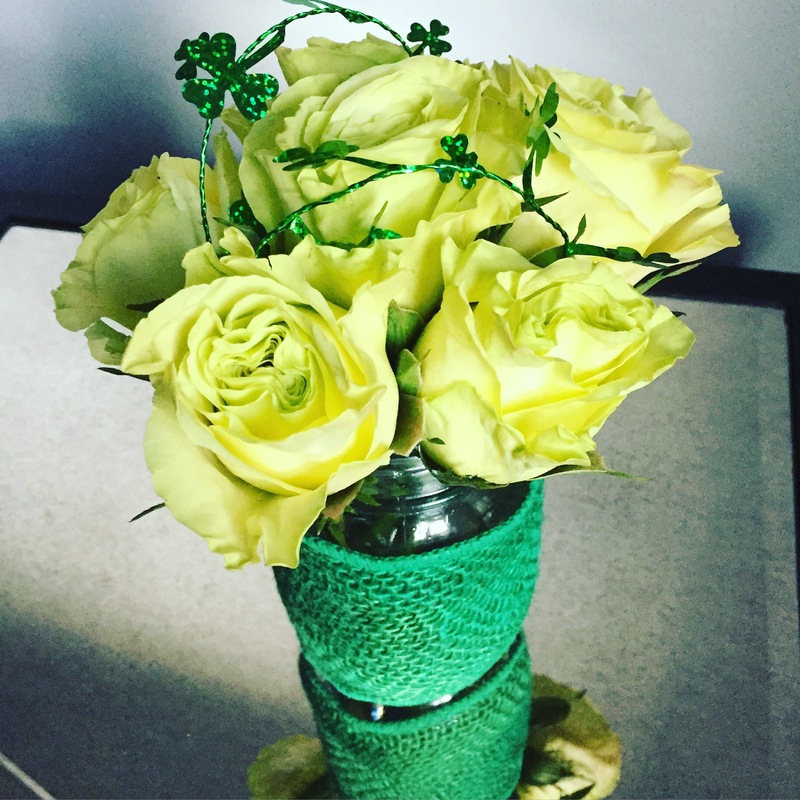 Simple Green Roses (I used 6). We are Irish. This is my month to shine. 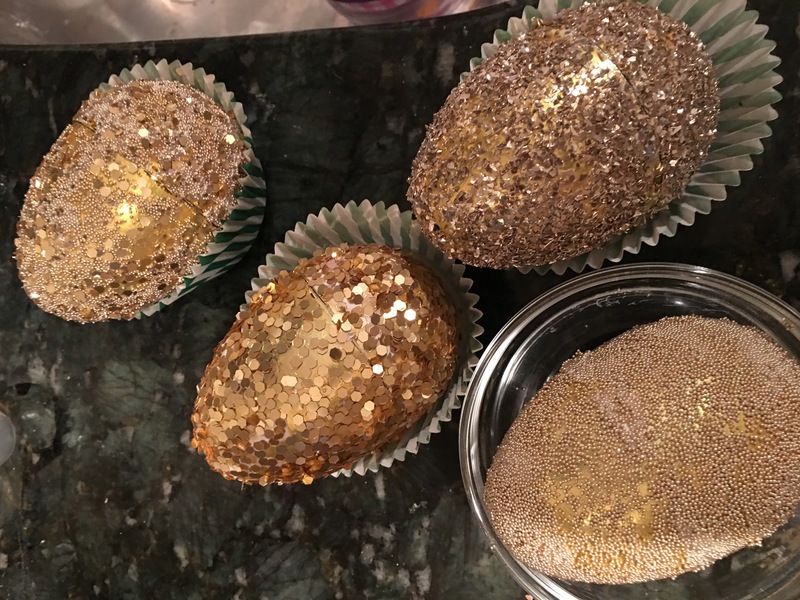 Baking has nothing to do with Saint Patrick…but I bake my way through the high holy day every year. 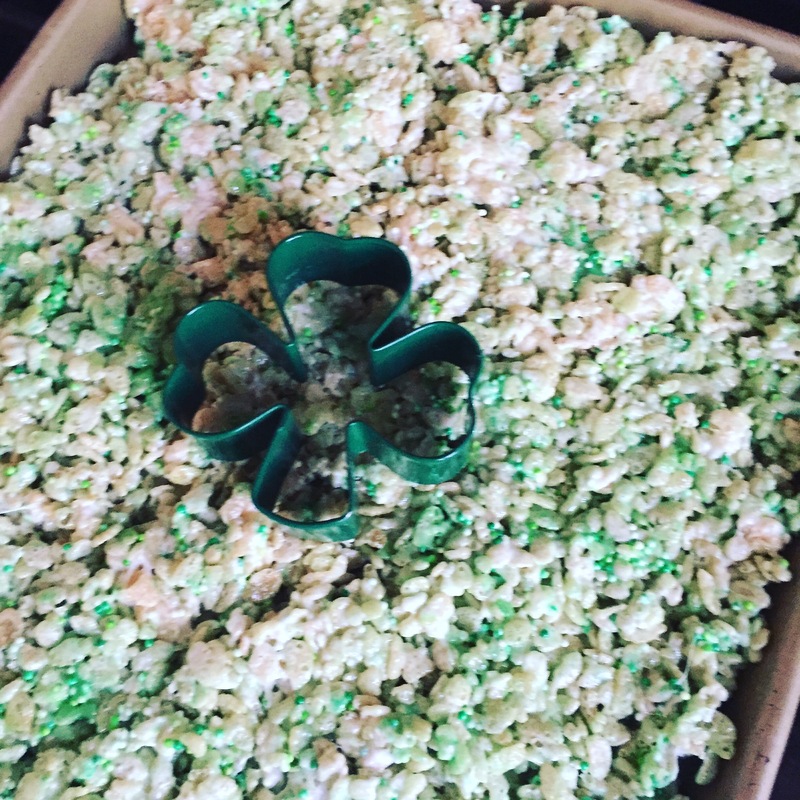 Today we started with Shamrock Rice Cereal Treats. Easy, little mess, and my little leprechauns were able to help me! Wins for everyone! I followed the directions on the box of cereal, only change was I made it easier. 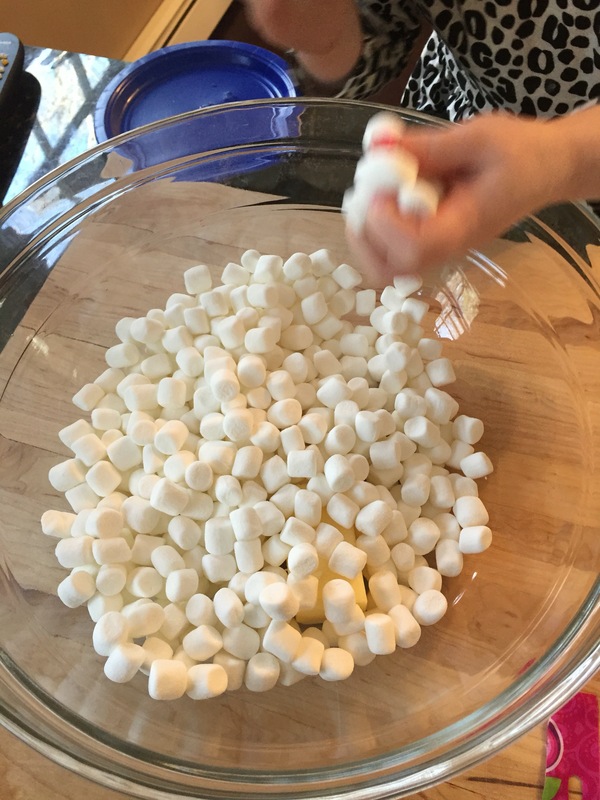 I took the butter and the marshmallow combo and microwaved it in a glass bowl for 2 minutes. Less mess. Once the mixture came out of the microwave we added the sprinkles. We used an entire small bottle of a Kelly Green, Lime Green, and White combo of Non Pereils. Then added the 6 cups of rice cereal. The Non Pereils give a nice tint to the treats, without the harshness of food coloring. 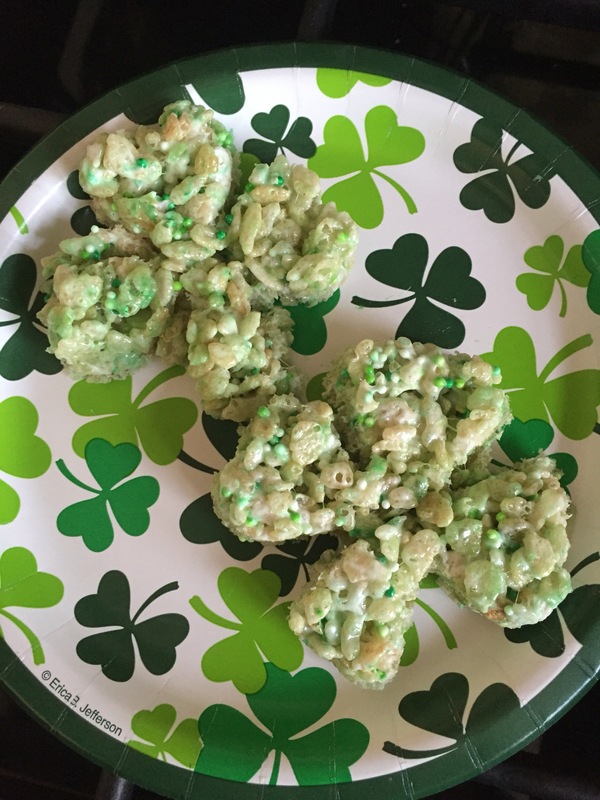 I spread them in a greased jelly roll pan, and let them settle for 15 minutes before I used the shamrock cookie cutter to make the treats. Done!!!! Holiday fun round 1 complete. The two things my brother loves the most, beer and bacon. Well he also love babes, but I was not going there. So since he is happily a proud member of the bachelor for life club, I decided to throw his 40th birthday party. Most of the food had bacon in it, but we did serve more than just beer. However thanks to my husband we did have a crazy beer selection. Bacon Menu: BLT Dip ( found a few recipes onPinterest), bacon wrapped shrimp, Potato Skins (with bacon), mini grilled cheeses with bacon, and pasta with a fresh tomato and bacon sauce. There was plenty of other items for those guests who did not want to raise their cholesterol. I figured the men would be in favor of the bacon items and the ladies would choose the “healthier treats”. I was correct. 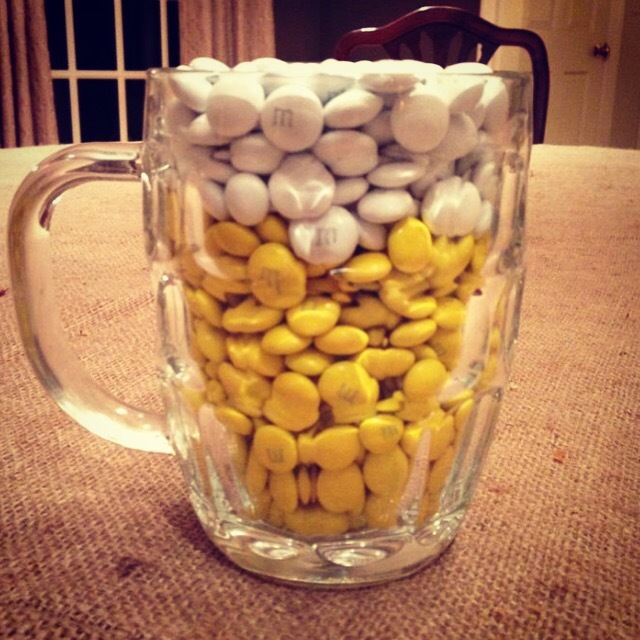 For the table decor I filled these old beer mugs with yellow and white “M&MS” and I of course realized after the party that I could have made Guinness decor the same way. Oh well, next time right!!!!! 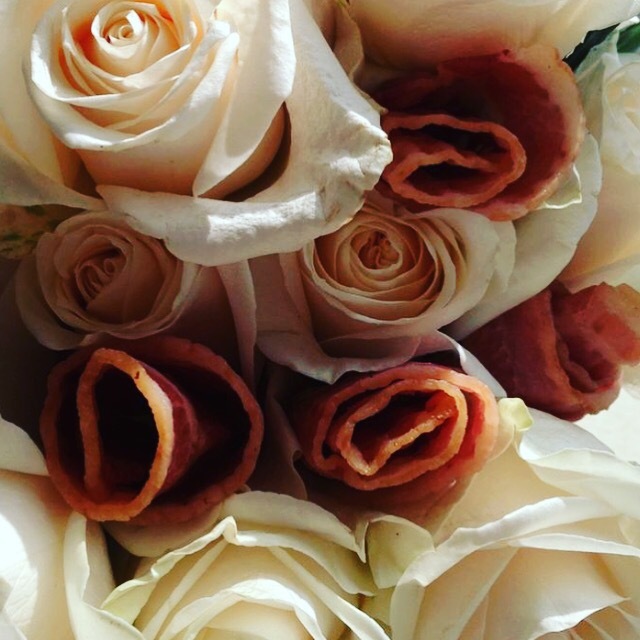 I was going to do all bacon flowers, but it was so horrible looking. So I made the rosettes and just stuck them between the white roses. I used pre made bacon. Everyone loved it…there is probably still bacon grease in my skin. I also had cookies made that looked like bacon and some that look like beer mugs. He was surprised and over all it was an easy event for us!